"Tony is my husband. He brought home a recipe he had gotten from someone at work, and it was adapted over time to this recipe--so I named it Tony's Summer Pasta. 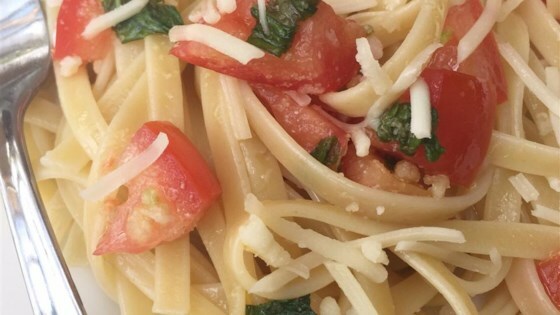 The tomatoes and cheese are marinated in oil, basil, and garlic, and then tossed with the hot linguine. The tomatoes are warmed and the cheese melts ever so slightly, creating a simple but delectable meal." Combine tomatoes, cheese, basil, garlic, olive oil, garlic salt, and black pepper in medium bowl. Set aside. Drain pasta, and transfer to a serving bowl. Toss with tomato mixture. Serve. See how to make a spicy vegetarian pasta with lots of Cajun seasoning.